Based on my experience with English learners, I’ve created a list of 8 types, or “archetypes,” of language learners. Most people are a mixture of 2 or 3, but as you read you’ll probably identify with a primary one. The list is separated into different levels and analyzes the mindsets that these language learners have as well as their ability to speak English. In my opinion most language learners fall into 8 categories, and chances are you fit one of the molds as well. You have achieved a high level of fluency. You’re not perfect, but you are pretty darn close to it. What makes you a powerful Jedi isn’t that you are often mistaken for a native speaker, but the attitude and dedication that brought you to that level. You realize that language learning is a journey and not a destination, and that there are always ways you can improve. You’ve worked hard to master your accent, increase your vocabulary and improve your cultural understanding. You are quite humble about your skills and get embarrassed when people compliment your English. You spent a lot of time on the internet while you were growing up and for you speaking English is almost second nature. You probably got to where you are without much formal study and taught yourself much of what you know. You embrace the culture that goes with the language and know all sorts of slang and other aspects. What possibly keeps you from becoming a Jedi is seriousness towards your study, and a will to master the language. You are cocky (too confident) about your language abilities and this excess confidence holds you back from true mastery. If you’re a warrior you like to practice your English whenever you have a chance. There’s a good chance you don’t always speak correctly, but you speak with confidence, and that makes you a successful learner. You’ve lived abroad for a few months and fell in love with the language and the culture so much that maybe you’ve considered getting a job teaching English. You do have some things that you need to improve, such as your pronunciation, grammar, and making your sentence flow more native-like. You know you need to improve which is why you’re planning another trip abroad as soon as you can. With consistent effort and concentrated study you have the potential to become a Jedi Master one day, but without humility you will turn to the path of the dark side and become a Sith Lord. You studied English in the best schools all of your life and your TOEFL results show how hard you’ve worked. Your knowledge of grammar is greater than most native speakers and you know 10 synonyms for the word ‘good.’ Your knowledge of English language is great, but when you speak with a native you lose your confidence and have a hard time understanding him. You study English the same way you would study Physics – treating it like a science with formulas to remember by constant drilling – and you have detached the human side of the language. What separates you from the Warrior is a lack of appreciation of the culture behind the language. You haven’t been studying English for that long, but you’re making good progress. You’re probably only taking English classes for a few hours a week, but you find ways to expose yourself to the language outside of class. Your English isn’t at a very high level, but that’s just because you haven’t been practicing long enough. This doesn’t stop you from trying to talk to a native speaker when you meet one. You enjoy watching American TV shows and wish you could understand them without subtitles. Once you travel abroad or go through an intense experience where you have to use your English you will realize how strong you are, and will start to call yourself a warrior. You’ve studied English before, maybe in high school or college, but if someone asks you if you speak English you will tell them no. You’ve had a bad experience with learning that has ruined your confidence. Your teacher probably wasn’t very good and they spent more time explaining things to you in your native language than actually speaking in English. You’ve been taught a lot of grammar rules and are afraid of speaking because you know just how many of them you might break. Despite these setbacks you still want to learn better English, but to do that you will need to face your fear and not be afraid to speak. Most of the planet falls under this category. You are a true beginner if you’ve never studied English before and don’t speak it beyond a few words that you’ve learned from pop culture. Maybe you’ve never had much interest in learning English or you haven’t had the time to study. At some point you may decide to learn English, and you will become one of the above types, except for English Speaker 2.0. You’ve given up on studying English altogether. For you, the language is just too hard to learn. Pronunciation doesn’t follow any logical pattern, verb conjugation gives you a headache and you don’t understand the grammar system. You make excuses for your failure: you had a bad teacher, you’re not smart enough, you’re bad at learning languages, it’s impossible to learn a language outside of the country it’s spoken in. You don’t take responsibility for your learning and blame everybody but yourself for your failure. You’re worse off than a true beginner because you have several limiting beliefs that are holding you back. So that’s it, those are the 8 types of English learners. I hope you’ve had fun reading this list and wherever you are on your English journey I wish you lots of success. Don’t ever give up, maintain your focus and one day you too can be a Jedi Master. I would love to hear from you in the comments about this article. 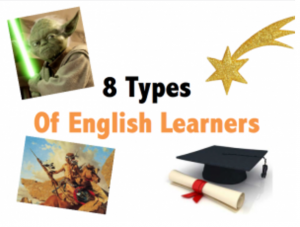 What kind of English Learner are you? More to come soon on this topic. If you found this article helpful, we greatly appreciate your feedback, participation, likes, sharing and telling your friends about us. You were able to encapsulate in few words what standardized tests can´t measure, the intangibles of language learning together with the different traits and stages that define us as language learners! Hey, Josh! Awesome article, dude, congrats! Those categories most definitely fit into the English learners' real world. I've always thought of writing something like you did, especially when it comes to the stereotypes and dedication! Solid reflections for teachers and students as well! I shall pass it on, with all due credits! Thanks for the comment Leonardo. Lets make Warriors out of all of those Rising Stars! Types of English learners. Really interesting =)). I don’t know what to say after perusing Josh’s article, particularly fascinating. Awesome Eddy! Thanks for leaving a comment. Glad it was helpful. Yes, Josh, it's really interesting and useful. Thank you for writing this good article.